23. "Timna, the 'Copper Kingdom,' with ancient vessels, an "X" and tiny figures in the distance": Negev Desert. Timna is one of Israel's more than 60 national parks and nature reserves, an amazing number of sites for a country no bigger than New Jersey! At Timna, copper was mined more than 6,000 years ago, and continued to be mined periodically through the early Middle Ages. But for me, what's special about this image is the pairing of past and present. 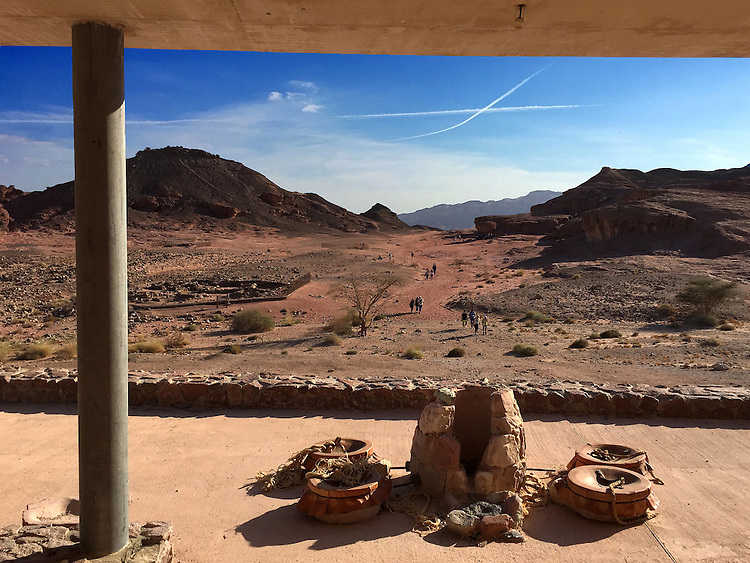 From the modern architecture of the visitor center, we see a desert without end, marked by an "X" from contrails that create the illusion that planes have been flying on a crash collision course (just as Arabs and Jews may seem to be today). Broken clay vessels are chained to the concrete, and the tiny figures of the park's visitors traverse the ancient sands.